Looking to buy safety vests in Rochester NY, Ithaca NY, and Western NY at competitive prices & with exceptional service? 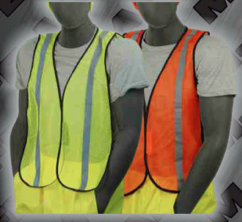 The Duke Company proudly carries the finest Safety Vests – Economy Mesh Vest in High Visibility Yellow and High Visibility Orange. A very economic solution when high visibility and economy are required. 1 inch wide reflective and 3 inch front velcro closures. Elastic side closures to enable one size fits all. NOTE: this is a non-ANSI class item.